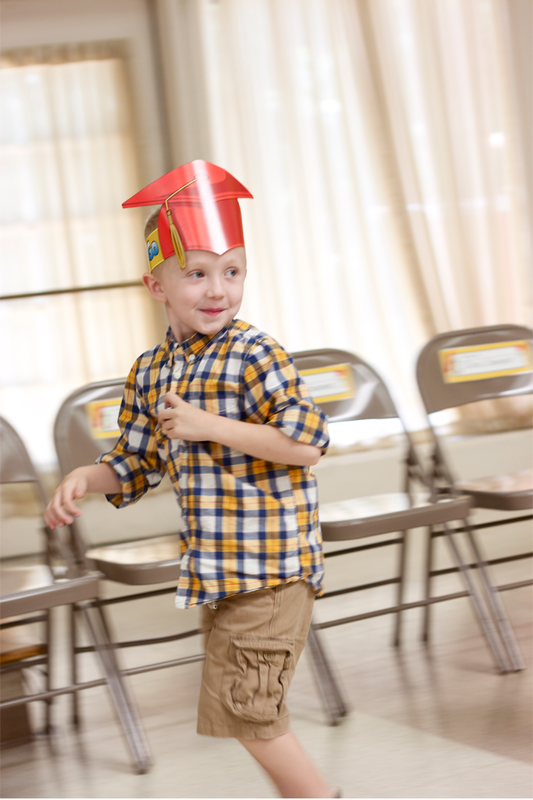 My boy graduated preschool. He did it! I had this heart-pounding-out-of-my-chest, proudest-mama-in-the-universe feeling when they called his sweet teachers called out his name. Brody Timothy Burkleo. Gulp. Thump. Thump. Thump. Blink back the tears so I get it all on film. Click, click, click with my camera. It was sort of strange and overwhelming all at once. He was being so goofy and couldn't take his eyes off all of us in the front row cheering him on. He skidded his flip flops across the floor and beamed. He was so proud and confident. I was so proud. This is the first time I've seen one of my children awarded for an accomplishment in front of other people. I cheer them all on the time, but to see it in front of everyone else, all those parents, all those classmates, our family… I just wanted to jump out of my chair and scream He's mine! That's MY boy! Thankfully, for those around me, I didn't. But I did on the inside, don't you worry. My preschool graduate. My soon to be full day kindergartner. How can I even type those words? It messes with my brain to even go there, knowing it's only a few short months away. Here's the thing. I'm every mom when it comes to schooling. I'm waving the yes you're going to school in the fall! flag with the public school moms. I'm excited for all that Brody can accomplish in kindergarten. I know that he will thrive, so much, off of a structured day in a classroom. But, I'm also with the I'm pulling him back into my arms, into our home, with all the homeschooling moms. I'm nodding my head in agreement with the private school moms that I want my boy to be educated by a follower of Christ, and to be taught creation and nothing else. But here I am, at a crossways, in between all three of these options. It's one of the hardest I've faced yet in motherhood. I'm throwing up my hands and bowing my head in prayer. We're doing what we feel is best for our boy at this point, and praying that it's right, and most of all, trusting the Lord with his precious life. He's not my own, even though he is. I find comfort in the fact that nothing is permanent and that as his mother, if we feel like what we choose isn't working, we can take him back into our home and figure it all out, as best we can. 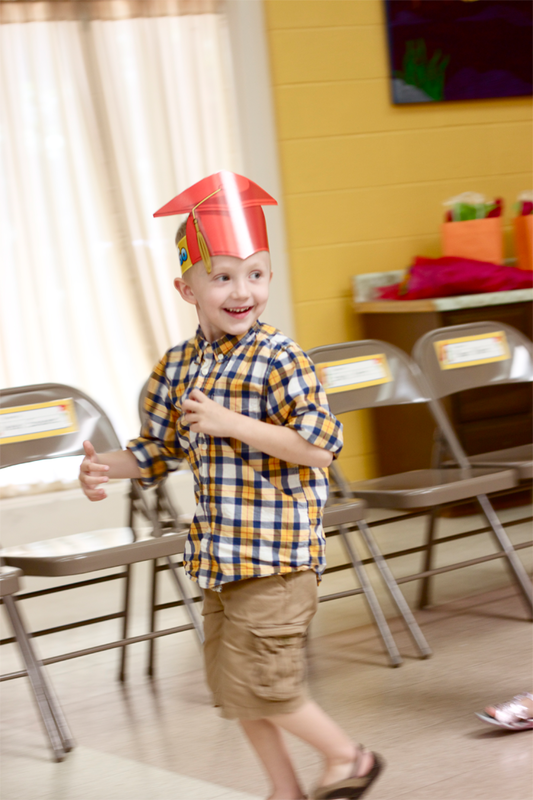 We're excited, nervous, and will cry our eyes out the day he starts kindergarten in the fall. Brody, Thanks for making me a mom. Thanks for teaching me so many things every day. Thanks for giving me grace and loving me all day long. Thanks for calling me mama, don't ever stop… please? And for asking the hard questions… thank you for that, too. I've never been proud as that day last week. You talk all the time about how excited you are for kindergarten. I hope you always have that passion for learning and I pray you always motivate me to be brave, like you do right now. I know you want to take the bus to school… but it just ain't happening, buddy. I can only handle one thing at a time. I love you to the moon and back. Love, Mom. Danielle- I love every little thing about this post. I am every mom when it comes to schooling too, and mothering... and life in general. I could see all of the school options working for us and in the end we have been so happy with our choice. it has been perfect for us and our needs. It's hard and scary to trust that you are making the right decision though... I often want a guarantee ahead of time but then i have to remind myself for the 9 millionth time that it doesn't work that way. darnit. I seriously wanted to roll my eyes at people every time they told me how exciting it was that my first-born was starting kindergarten. i was sick over it and could not see it that way at all. it was exciting though, to see him grow and learn and make friends and have a teacher that he loved and truly loved him for him. sigh,. this parenting thing is so hard and so good at the same time. oh so totally crying after this. and I also feel the crossroads and the back and forth. but like you said...we can always change course. I just want the Lord to lead us into which is best for our kids! You are such a good mama and have so many reasons to be proud. and HE has even MORE reasons to be proud of his mama. :) love you girl. well. let me just tell you. i sent my oldest off the the wolves last year and by wolves i mean school. i prayed and prayed and prayed ... on the issue of homeschool ( which i really wanted to do ) private school and public school. at last i felt god leading me to put her in public school ( to which i fought him on lol ) and i was really rough for me at first i cried everyday for two weeks before school started. i spent the school year praying for her teacher and the school year was a huge success. huge she learned and grew so much! James is starting preschool this fall. Graduating preschool might kill me. Praying & trusting is all we've got sister.